New Derry Under 20 manager Mickey Donnelly pictured during his reign as Tyrone minor manager. Former Tyrone minor manager Mickey Donnelly is the new Derry Under 20 manager after being ratified at a County Board meeting on Friday night. Donnelly led the Red Hand minors to the 2012 Ulster Minor Championship title before losing out to Mayo in the 2013 All Ireland Final on a scoreline of 2-13 to 1-13. The Aghaloo club man also led Mayobridge to three Down Senior County finals and won the Tyrone Senior Championship with Ardboe. He also won two Ulster vocational schools titles with St. Paul’s JHS, Lurgan. As a player, Donnelly won Intermediate and Junior championship medals with Aghaloo and Ulster vocational schools medals. "Following tonight’s meeting of Coiste Chontae Dhoire, we are pleased to confirm that Mickey Donnelly has been ratified as Derry under-20 football manager for a three year term," said a County Board statement. "2018 will see under the under-20 grade replace under-21. 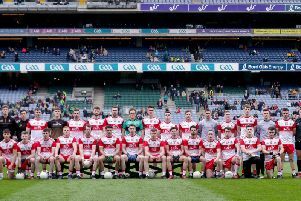 Derry will play the winners of Cavan/Donegal in the Ulster quarter final on a date, time and venue to be confirmed."